My Year 7s have been investigating the influence of religion on people's lives during the Middle Ages. 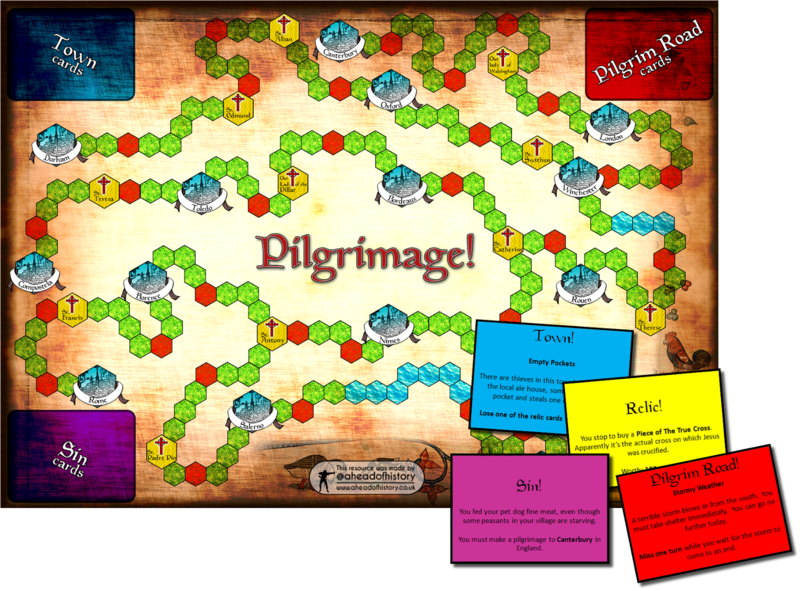 As part of this, I wanted to do something a little exciting and new with them on medieval pilgrimages, so I made them a board game to play. The aim was to build up their knowledge of what a pilgrimage was and some of the most important pilgrimage sites and shrines in medieval Europe. Armed with Photoshop, I made the playing board, which of course was not intended to be geographically accurate! At the start of the game, students were required to draw a card at random, which informed them of their particular sin and allocated them a pilgrimage destination. There was much uproar among the students who drew cards requiring them to travel as far as Jerusalem, while those who were offered pilgrimages to Canterbury seemed certain they would reach their destinations first. I also wanted them to get a sense that pilgrimages could be difficult and testing journeys, so as they moved through the game, students had to draw event cards which inflicted both good and bad luck on the pilgrims. Cue lots of excitement as they struggled through poor weather inflicting a few missed turns and thieves on the road depriving them of some of their cherished holy relic cards! As students played a second round, they were asked to take notes on what happened to them on their pilgrim's diary worksheet. By the end of the game, students had acquired enough knowledge to write a short, historically accurate piece of fiction about a pilgrim's journey as a piece of consolidation work. I've uploaded the board game template, the game rules and the game cards into my resources section, which you can access here.